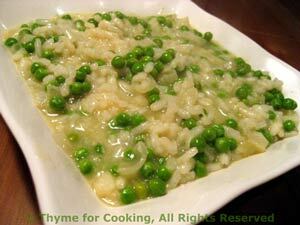 Rise e Bisi, Risotto with Peas, a luscious, creamy side dish. In medium sauce pan heat butter; add shallot and sauté until transparent, then add rice and sauté, stirring, for 2 - 3 minutes until rice has white center. If the peas are frozen add to the stock now. When the rice has almost absorbed the stock add another 1/4 cup and the peas if they are fresh. Before the last 1/4 cup is added taste a few kernels of rice. They should be just 'al dente' - slightly resistant to the tooth but fully cooked. You may not need the last 1/4 cup. If more stock is needed add it 1/8 cup at a time and waiting until almost completely absorbed. If using frozen peas, strain them from any remaining stock and add now. Stir in the Parmesan.